If you suspect that you’re developing vision problems or are simply interested in a routine checkup, our eye doctors serving Peabody, MA will get you the right prescription with our comprehensive eye exam. 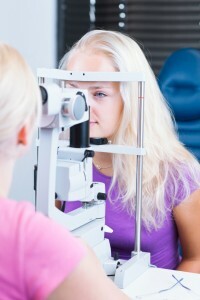 The optometrists at Parrelli Optical have decades of combined experience and brand new equipment. We carry over a dozen eyewear brands, so you’ll be able to find a pair of glasses to perfectly fit your tastes. It’s not enough to simply prescribe a new set of glasses or contact lenses. Even if you can see just as well as last year, your eyes might be developing cataracts, or you might have some blind spots that you don’t know about yet. Our comprehensive exams can also help identify other types of diseases such as diabetes and high blood pressure. Compared to other optometry firms, Parrelli Optical’s 15-point eye exam provides a more accurate diagnosis. With your new lens prescription, you’ll be able to comfortably focus at any distance. Parrelli Optical also provides pediatric eye doctors to monitor your child’s vision and prescribe eyewear before they begin to fall behind in school. We recommend annual eye checkups for you and your family to maintain your prescriptions and catch any problems before they grow worse. Parrelli Optical eye doctors in Peabody, MA offer a huge selection of brands and styles for you to choose from, so you won’t need to take your prescription to another store just to pick out your glasses. With 19 frame brands, you’ll be able to find a pair of glasses that you’ll love. Parrelli Optical also carries a large variety of contact lenses, sunglasses, and sportswear to help protect your eyes. Parrelli Optical accepts most insurance plans, but give us a call to check if this is your first appointment with us. To keep your vision healthy, schedule an appointment with Parrelli Optical eye doctors in Peabody, MA today.